Whether you're celebrating Chinese New Year or a dragon boat festival, looking for a great activity for a How to Train Your Dragon party, or simply want to have a good time making your very own fantasy beast, these cool dragon crafts are fun for kids of all ages. From fire-breathing masks to cozy spiked fleece hats, there's something that will be sure to spark your imagination. This adorable mask is easy to create and makes a great party activity. It's also a fun choice for a rainy day, since you may have some of the supplies already on hand. Younger kids may need a bit of help with the cutting, but older kids can do this craft independently. What Should I Name My Bearded Dragon? Start by drawing two semi-circles near the upper edge of the paper cup to act as your dragon's eyes. The curved portion of the semi-circle should face the rim of the cup. Use the scissors to cut along the curve you drew, but don't completely cut out the semi-circles. Instead, fold them back against the cup so they stand up. Cut out two small pieces of orange construction paper. These should be just a bit larger than the eyes you made in step one. Glue these pieces inside the cup to cover the holes you made. Glue a googly eye to each of the eyes you cut for your dragon. Cut the crepe paper or tissue paper into strips that are about one foot long and about an inch wide. You'll need at least 12 of these. 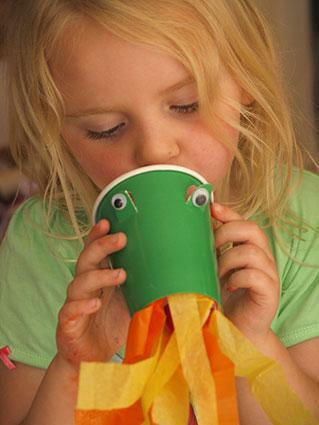 Glue the strips to the inside of the bottom edge of the cup to make your dragon breathe fire. Wait for the glue to dry. When your mask is dry, poke a hole on either side of the cup, near the upper rim. Tie a piece of elastic cord through the holes to help hold the dragon mask on your face. Put on the dragon mask and have fun! Note: If young kids will be playing independently with the dragon mask, skip the elastic cord to avoid a strangulation hazard. You can create a festive atmosphere at home or at school with this fun and easy craft. This project is perfect for pre-schoolers to do with a little help, and it's a great independent activity for older kids who are confident with scissors. Because you can vary the details of this design, it's an exciting challenge for any age. To get started, choose the colors you want for your dragon's body. You can make the paper chain all one shade or use a rainbow of different colors. Either way, cut at least 10 strips of paper to use in the chain, making them about an inch wide. Paint dragon scales or fun designs on the strips and allow the paint to dry. 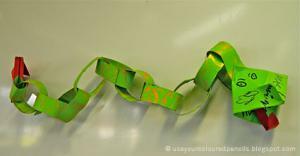 When the paint is dry, use glue to form the strips into a paper chain. If you want the dragon to have a distinctive tail, use a bright contrasting color for the final loop in your paper chain, and pinch the end to make it a tear-drop shape. For the dragon's head, younger kids can cut out a circle of green construction paper and fold it in half. Older kids can experiment with origami by folding a small simple paper hat. Decorate the head with markers, drawing eyes, a nose, and any other facial features you want. Cut a one-inch wide strip of red construction paper. Roll it around a pencil to make it curl, and then glue it inside the dragon's mouth. If you want, you can also cut white construction paper triangles to make teeth for your dragon. Glue your dragon's head to the paper chain body and allow the glue to dry. Then hang up your decoration and enjoy! This adorable hat is a fun craft for older kids. Because it requires some precision with the cutting and gluing, it may be frustrating for pre-schoolers and younger elementary students. Start by cutting a triangle out of green felt. You can choose the size and shape, but it should be at least two inches tall. You'll use this as a pattern to cut 15 more triangles exactly like the first. To do this, place the triangle on top of the felt and trace around it with the marker. Repeat until you have 15 more triangles drawn on the felt, and then cut out all the triangles. Place one triangle on the work surface in front of you. Spread fabric glue on the triangle from the point down, stopping about half an inch from the bottom. Pick up another triangle and line it up with the first one, gluing the two pieces together. Repeat with the remaining triangles to create eight spikes. Each spike should have a half-inch section at the bottom that is not glued. While the spikes are drying, cut two diamonds out of green felt. Cut out two small black circles and glue these to the center of the diamonds. Glue the diamonds on your hat for the dragon's eyes. Pick up one felt spike and open up the bottom, unglued portion of the triangle. Put some fabric glue on this part and then press it down on the center of the top of the hat. Use pins to hold it in place. Repeat with the other spikes to form a ridge of spikes going over the top of the head. Allow these to dry, and then remove the pins. 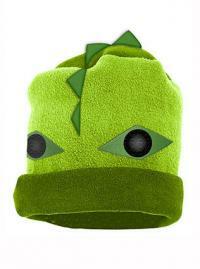 Have fun wearing your very own dragon hat! Dragon crafts are a great way to use your imagination and get creative at the same time. Add your own touches to these fun projects to make them unique. You'll be proud to show off your fantastical beast at home or at school.